What is often problematic in trying to recreate the life of a musical talent, is that they cram in as much information as possible, leaving most of the story feeling contrived or making the said star wholly unperson-able. Not the case with this biopic of Beach Boys front man, Brian Wilson. Director Bill Pohlad has cleverly taken two periods in the great man’s life to explore, allowing us to seriously get inside a genius’ head. Early 1990’s and a man walks into a car showroom and wants to buy a car. Sales woman Melinda seems a little bemused by the man’s behaviour yet there seems to be something about him. Then Dr Eugene Landy arrives and announces that the man is Beach Boys’ former front man, Brian Wilson. Melinda, fascinated by this strange man, agrees to go on a date and a relationship begins, although there is something unhealthy about Dr Eugene’s treatment. Meanwhile, back to the 60’s and a younger Brian Wilson has had enough of surfer songs for the band and wants to take them on a different direction. Finding everyday noises and unusual ways of playing instruments, Brian creates the album, Pet Sounds, but in the process causes rifts within the band and some serious problems for Brian himself. Sometimes having two stories running parallel to each other can cause confusion and seem gimmicky. Not so here. Pohlad holds the two threads together well, not necessarily jumping from one to the other when there could be a connection but when there are slight mood changes. Filming the sixties scenes in a grainy, bright coloured, almost psychedelic manner manages to distinguish the two parts, although it doesn’t seem necessary when the two leads playing the same character are so good. The strength of this tale in the performances. Pohlad has surrounded his film with quality. As the suspicious Melinda, Elizabeth Banks is allowed to show her acting skills, instead of just reduced to playing a compere (which she seems to be doing a lot recently. See Hunger Games, Pitch Perfect, Magic Mike XXL). Never overplaying her role, she quietly holds the pieces in the 90’s sequences. Paul Giamatti, who has become a master of the nasty, gives another powerhouse performance of pure vileness as Dr Eugene, a man who has an incredible hold over Wilson, for whatever manner. He comes across as all nice and having Wilson’s best interest at heart yet there’s a darker side to the story. Then there are the two Wilsons. As the elder, it’s a welcome return to form for John Cusack, who, for years has made some pretty ropy decisions about his career. Here he is back on form in a heartbreaking and quietly unassuming way. 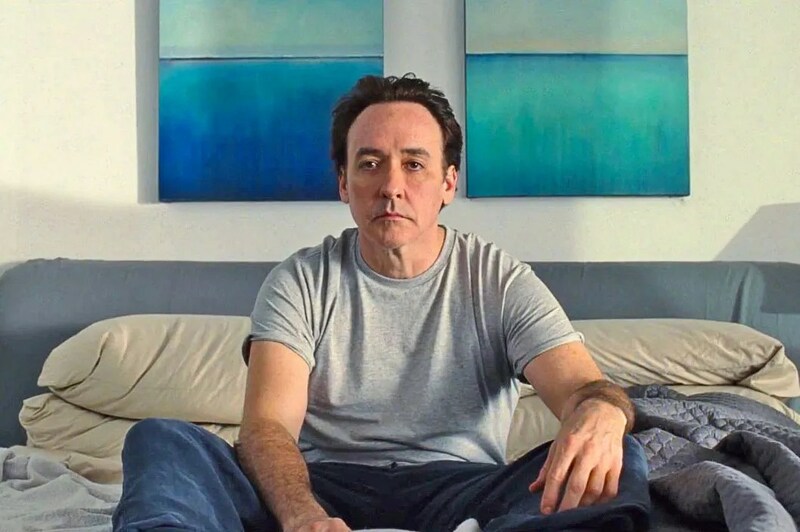 As a man torn between wanting freedom and having to do what he is told, Cusack doesn’t need to scream and shout, yet his performance speaks volumes. As the younger, Paul Dano has a harder job and yet he takes in on with ease. With his musical genius almost engulfing him, Dano is like a furious tidal wave, commanding the screen with every scene. With ideas coming out of his ears, leading to bizarre behaviour and questionable obsessions, Dano takes the role on full steam and is just incredible. Come awards day, someone needs to take note of Dano’s performance. Love & Mercy is a surprise of a film. Not only is it littered with terrific performances from the four leads but we sometimes can forget just how good the Beach Boys really were, especially the album that has now been labelled a classic, Pet Sounds. This film is a love note to that album but also a fascinating, sometimes startling and shocking tale of a man who just wanted to make the best music ever. Highly recommended.